The front axle and the steering are all combined in one set-up. This steering has to be pointed out to be a bit crude and may be responsible for a kart tipping over if driven dangerously. The picture below gives a good clear idea of what is happening. Basically a 2"x3" (50mmx75mm) piece of wood 550mm long is needed. A plough (trench/ groove) is taken out of the middle of this piece of timber. Into this slot fits the main bar/ front axle upon which the front wheels spin on. A hole has to be taken out 225mm in on this length of wood to allow for the steering of this front piece. The thing is that this bolt (13mm) has to be counter bored to below the metal axle. (see front and end elevation, bottom left of picture) This metal bar/ axle has to be kept one piece in length 650mm long and must not be cut in the middle. 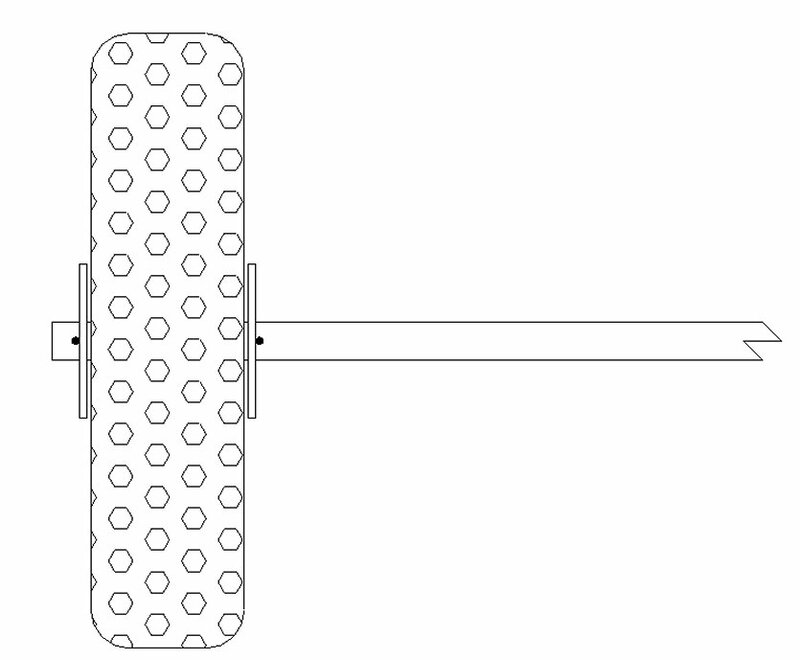 The diameter of this bar/ axle is mainly to accommodate the wheels you plan to use. The idea is for the wheels to basically spin on this axle. The wheels are to be held on this axle with split pins and washers. This middle bolt connects up with the main piece in the middle of the kart and allows this main front piece to turn freely (provided this bolt is not over tightened). 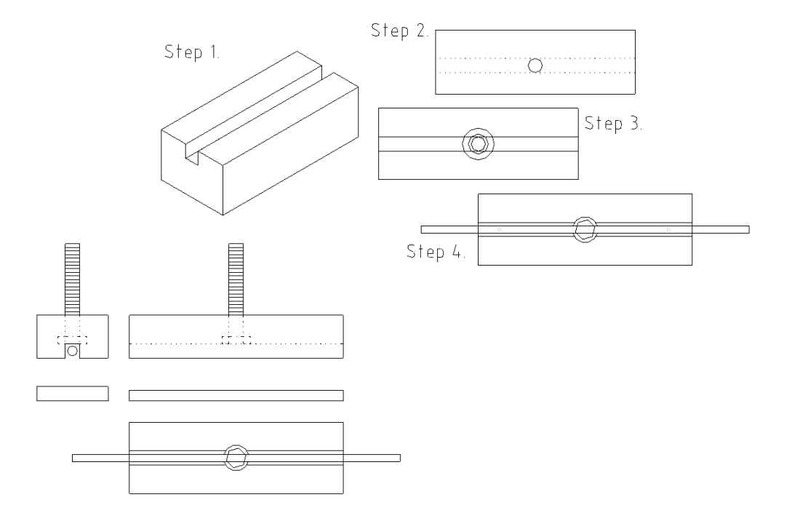 What one can also do and I recommend, is to drill a 3mm hole in the axle 1/4 way in from both ends and to nail the axle/ metal bar securely into the groove/ plough as to stop the axle from moving around inside the 2"x3" piece of wood. There is also a backing plate to this 2"x3" piece of wood to cover the plough and the metal axle helping to keep the axle in position. Below is a picture showing how the front wheels will be held onto the axle via split pins and washers. Basically what one does is to place the wheel onto the axle in the desired position, place a suitable washer on both side of the wheel. Mark on the outside of the washer on the axle the position of the hole to accommodate the split pin. Drill the hole as close to the washer as possible. When the hole is drilled you can buy special split pins, or what I just done was to put a 2" nail into the hole and bend it around so it wouldn't fall out thus keeping the wheel running freely and in position on the axle. Before final fitting you will need to fill the axle and inside of the wheel with grease as to keep it running freely. This grease will have to be replace and refreshed after a few hours of karting.